It’s becoming the norm at BMW. First, the standard model comes out and then a few weeks later its more athletic sibling with M Performance goodies joins the lineup. Some would say the 5 Series GT 6 Series GT is not exactly worthy of the sporty treatment, but let’s not forget that even the 2 Series Active Tourer minivan can be had with an M Sport Package, so anything is possible. The go-faster BMW M GmbH division was in charge of developing the parts tailored to the new model, starting off with a sporty exhaust system aiming to deliver a “truly impressive acoustic and visual dimension.” Those are some big words, so we’ll have to hear it ourselves to believe it. Available for the 630i and 640i xDrive models, the new system comes with a stainless steel silencer and has trapezoid or round tips in carbon fiber or chrome, depending on the model you go for. The round ones are adorned with an engraved “M” logo whereas the others come with “M Performance” lettering. Moving on to other bits compatible with the new 6 Series Gran Turismo, big 21-inch alloys with a two-tone finish and a two-level double-spoke design are available. These stylish wheels provide a mélange between glossy surfaces and burnished areas. Behind them is the upgraded braking system with aluminum four-piston fixed red calipers at the front teamed up with single-piston calipers for the rear axle. More glossy touches are noticeable at the front where BMW’s corporate kidney grille has a shiny black appearance while the side profile shows a pair of mirror caps dipped in carbon fiber reinforced plastic. The 6 Series Gran Turismo depicted here is wearing a multi-layer paint with a Frozen Black foil combined with black and grey matte stripes. We’re not able to have a look inside the cabin just yet, but BMW says its new GT has a sporty steering wheel partially covered in Alcantara and Nappa leather. Even M-branded floor mats are available. Should the package be to your liking, BMW mentions it will offer all of the above mentioned parts from day one. Specific accessory products inspired by motor racing add individual style to the new top-class model. Munich. 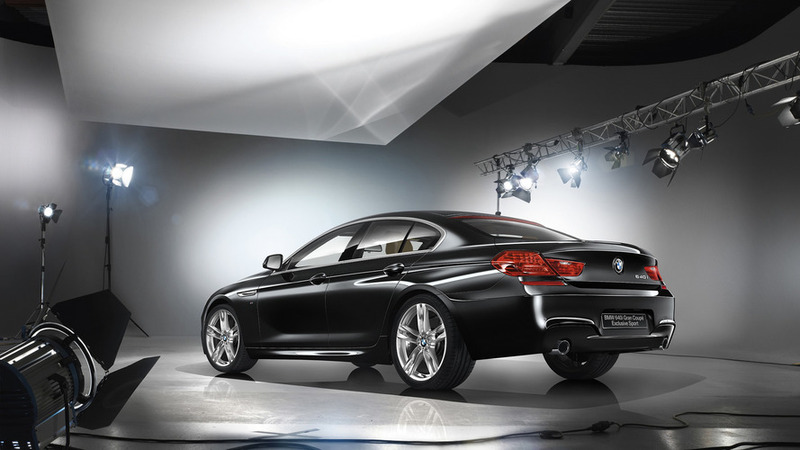 The new BMW 6 Series Gran Turismo is fascinatingly elegant, highly versatile and outstandingly dynamic to drive. In order to demonstrate the sporty character of the model, the model-specific BMW M Performance Parts will already be available at market launch in November 2017. The customised and motor racing inspired retrofit parts for drive, suspension, exterior and cockpit enhance dynamic driving even further and give the new BMW 6 Series Gran Turismo an individual and powerfully expressive appearance. The BMW M Performance exhaust silencer system gives the new BMW 6 Series Gran Turismo a truly impressive acoustic and visual dimension. It gives the rear a striking look and ensures a sporty sound which is, however, also suitable for long-distance travel. The silencer is made of stainless steel and was especially developed for the petrol engine models BMW 630i Gran Turismo (combined fuel consumption: 6.6 – 6.2 l/100 km; combined CO2 emissions: 152 – 142 g/km), BMW 640i Gran Turismo (combined fuel consumption: 7.4 – 7.0 l/100 km; combined CO2 emissions: 169 – 159 g/km), BMW 640i xDrive Gran Turismo (combined fuel consumption: 8.2 – 7.7 l/100 km; combined CO2 emissions: 187 – 177 g/km). Depending on engine type and equipment, it comes with either round or trapezoid tailpipe trims in chrome or carbon fibre. The round tailpipes feature an engraved M logo and the trapezoid tailpipes the M Performance inscription. Driving dynamics and visual appeal of the new BMW 6 Series Gran Turismo both profit from the 21 inch BMW M Performance light alloy wheels. They are manufactured using weight-saving forging methods and feature a two-level double-spoke design in bi-colour composition. The high-gloss paintwork is combined with burnished surfaces for the outer spoke level and the wheel rim. The exclusively designed wheels have mixed tyres in the sizes 245/35 R21 on the front axle and 275/30 R21 on the rear axle, complete with emergency running properties. The sport braking system, which is also available for the new BMW 6 Series Gran Turismo, optimises both the dynamic driving experience as well as the car’s visual impact. Even when driven in extremely dynamic fashion, the new BMW 6 Series Gran Turismo achieves constant braking performance by means of inner vented, perforated lightweight construction brake discs with 4-piston fixed caliper brakes made of aluminium on the front axle and single-piston floating caliper brakes on the rear axle. Red brake calipers serve as a visual indication of the fact that the design of the BMW M Performance sport brake system is derived from motor racing. The high-gloss black BMW M Performance kidney grille gives the front of the new BMW 6 Series Gran Turismo a specifically dynamic look. In combination with the black trim bars of the air flap control, the BMW kidney grille receives a perfectly colour harmonised appearance. The BMW M Performance exterior mirror caps in carbon fibre are yet another visual highlight. The components made of carbon fibre reinforced plastic (CFRP) are elaborately crafted by hand especially for the new BMW 6 Series Gran Turismo. Multi-layer paintwork and high-gloss finishing give the car’s surfaces their striking intensity. The BMW M Performance Frozen Black foil superbly accentuates the sporty-elegant lines and the harmonious proportions of the new BMW 6 Series Gran Turismo. The matt black and grey trim stripes match the car’s geometry perfectly. The BMW M Performance sports steering wheels gives the new BMW 6 Series Gran Turismo a special motor racing touch inside the cockpit. Its alcantara-covered grip areas, large thumb rests and the slightly flattened lower section make it a pleasure to hold, provide optimum grip and ensure direct steering response. Soft nappa leather both in the upper and lower section as well as on the steering wheel trim, a silver-grey cross-stitch seam and the red central marking at the 12 o’clock position round off the highly dynamic design of the BMW M Performance sports steering wheel. It also features shift paddles for manually selecting gears in conjunction with the 8-speed Steptronic sports transmission. BMW M Performance foot mats are also available in the cockpit product range. 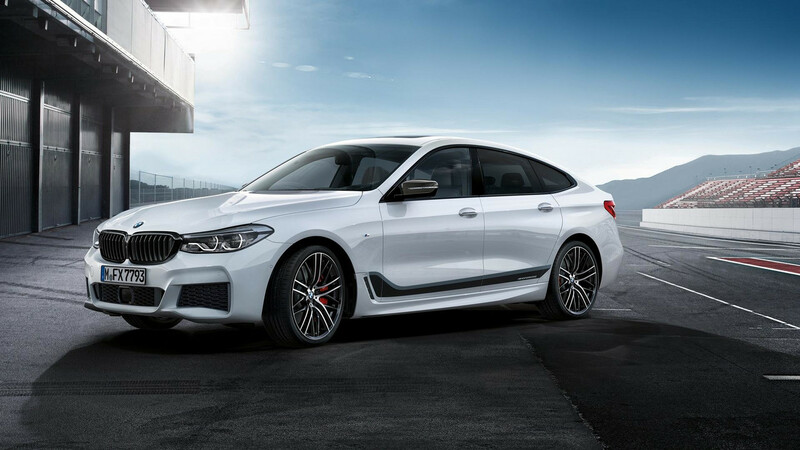 The model-specific retrofit options from the BMW M Performance range will be available right from the launch of the new BMW 6 Series Gran Turismo. All products form part of the Original BMW Accessories program, sold and installed through the BMW dealer network, BMW sales subsidiaries and BMW Service Partners.